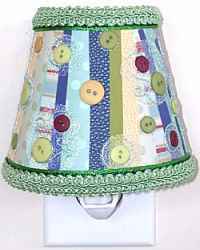 Make a beaded lampshade for a nightlight, without any sewing. The secret's in the double-sided tape. By day it will look elegant and decorative, and by night it will light the way in a darkened room. 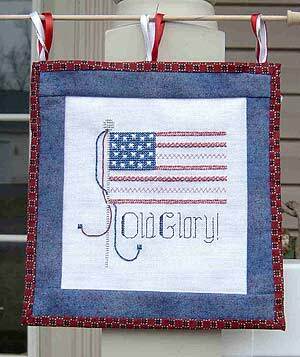 This design makes a great gift, home decor, or finished product to sell at a craft fair. 1. 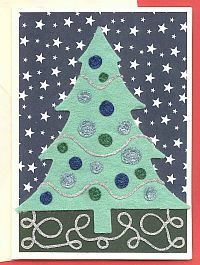 Cut your paper into strips of varying width. Make each strip 1" shorter than your shade. Peel off your shade's liner and use it as a guide- trim your strips so they fully cover the design area without overlapping too much, and leave 1/2" above and below the strips for your trim. 2. Begin applying the strips centered on your shade. When you have finished, press with your fingers to smooth out any air bubbles. 3. 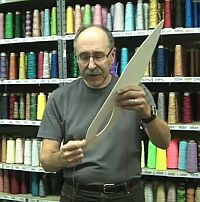 Using your 1/8" ribbon, create a border around the top and bottom of your strips. Next, cover the rest of the exposed shade with your braided trim. 4. Place your Treasure Tape dots and circle shapes around your design. Peel back the red liners one at a time and position your buttons on them. 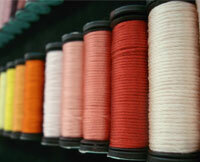 Using your Star Blue braid, embellish around your buttons. 5. 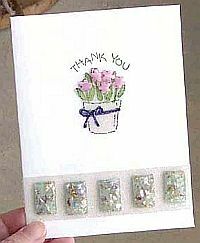 Finish your design by placing it in a shallow tray or ziploc® bag. Pour Diamond Beadlets over the remaining tape. Tap gently to remove excess beads. Place your shade on your nightlight, and enjoy! If you have trouble printing this page and would like us to send you a printed copy send a #10 SASE to: Cute As a Button Nightlight Shade, P.O. Box 1258, Parkersburg, WV 26102.